Hassan JOHO wants the Treasury to disburse the remaining 23 Billion immediately as claimed by the President. - Bana Kenya News, Real African Network Tubanane. 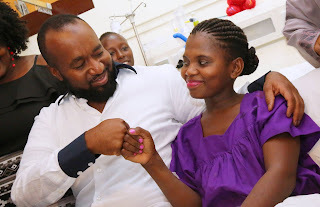 Home featured Mombasa Hassan JOHO wants the Treasury to disburse the remaining 23 Billion immediately as claimed by the President. Hassan JOHO wants the Treasury to disburse the remaining 23 Billion immediately as claimed by the President. The Mombasa governor today has written a letter to the treasury demanding the 23 Billion that the president talked about yesterday. 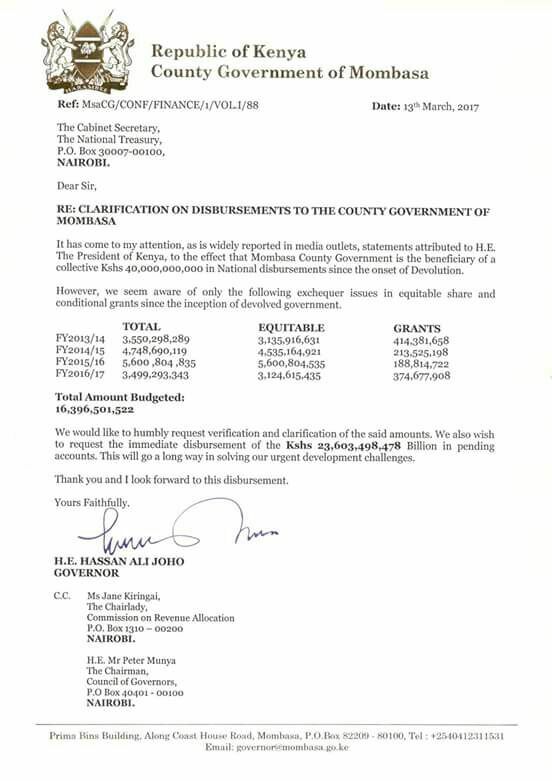 According to the Governor, the county has received only 16 Billion since 2013. The Governor demanded to know the reason why the treasury did not give out the 23 billion and gave the president false information about Mombasa.The statement was also copied to the newsrooms. "Mombasa county has received 16 Billion since 2013 but yesterday I had from the president saying it was given 40 Billion. I just wanted to understand where was that money? Now if they held that money and give me less, what was the motive? Now I have so many projects pending because of insufficient funds. If 40 Billion was allocated to Mombasa county and then hidden, now it's time to give out the money. "Says Joho. The letter that was written to Treasury cabinet secretary Henry Rotich outlines what the county was given and what is now remaining on the 40 Billion. 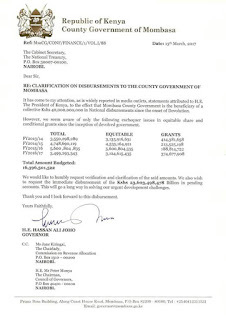 The governor asked the cabinet secretary to disburse the claimed county budget immediately. The Jubilee Gubernatorial aspirant Suleiman Shahbaal also told the Governor to explain how he used the county budget allocation. The JAP gubernatorial aspirant Suleiman Shahbaal lobbied the Mombasa county people to ask the governor on what he did with 40 Billion shillings since 2013. He demanded the governor to show at least one complete project in the county.